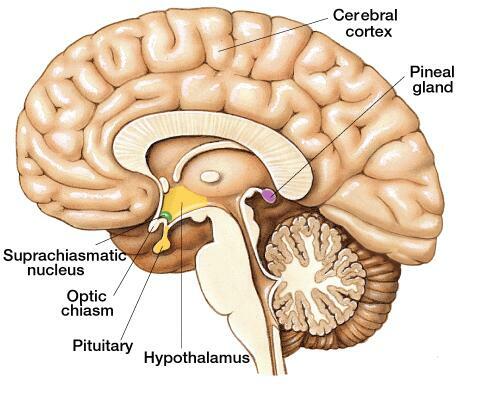 The pineal gland may also be referred to as the “third eye,” epiphysis or conarium. This endocrine gland is located on the vertebrae at the center area of the bottom of the brain, just where the two hemispheres meet. The pineal gland is responsible for producing melatonin, a derivative of serotonin that will provide seasonal functions and the wake/sleep schedule of the body. As you age the pineal gland can become calcified, causing calcium phosphate to develop over the gland. Fortunately, there are ways to decacify the gland and prevent calcium phosphate buildup in the future. Once you have discovered or suspect that you are experiencing calcification of the pineal gland, there are methods you can take to help prevent further damage and reverse the damage you are already experiencing.